Sunnyside Nursing and Post-Acute Care Community Garden ribbon cutting ceremony: The garden was donated to Sunnyside, by Orchard Supply Hardware, as part of their community outreach program to enrich the lives of local residents, in this case, the residents and patients at Sunnyside. The soil, maintenance material and initial installation labor, were donated by Orchard Supply Hardware. This project was spearheaded by Christine Ongjoco, the granddaughter of a former Sunnyside resident. Christine, a senior at UC Santa Cruz, worked with the Carson Community Youth Garden, the Everett Program at UC Santa Cruz and Orchard Supply Hardware to bring a senior friendly edible garden to our residents. Her goal was to enhance the lives of our nursing home residents through gardening, and encourage empowerment, responsibility and socialization among the seniors. The new garden, located in the transitional medical unit patio, boasts two large custom-built raised garden boxes, ideal for wheelchair accessibility. Growing in the garden are a variety of edible plants and herbs, such as strawberries, basil, rosemary, and cilantro. In attendance was Elito Santirina, the temporary Mayor of Carson, our administrator Shane Dahl, Christine, and the hardworking team from Orchard Supply Hardware. This charity event was a collaborative effort between our partnering physicians and other healthcare organizations in the community. 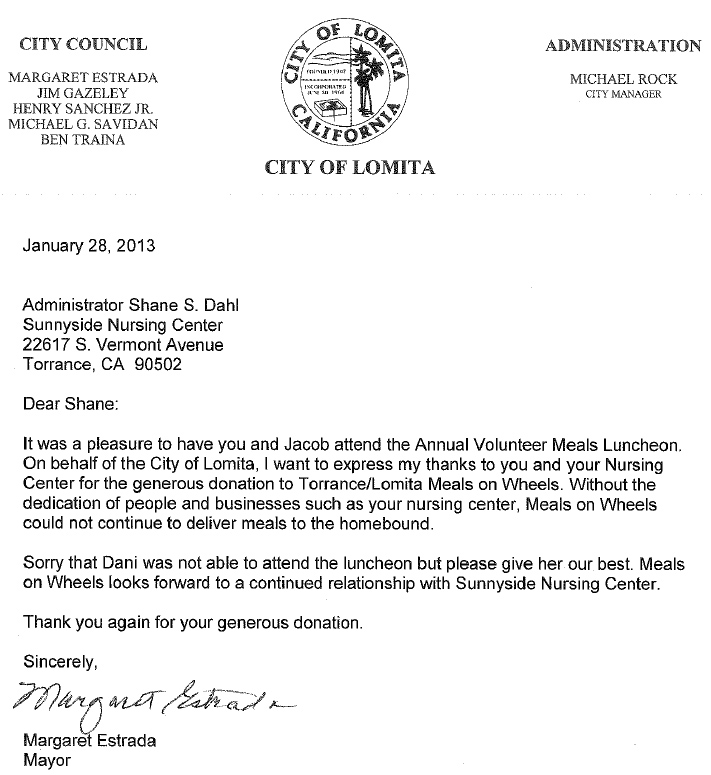 Giving back is what we are about at Sunnyside and caring is the basis of our existence as a nonprofit organization. Visit our Facebook page,www.facebook.com/sunnysidenursing to view pictures from the event and to follow us in the future.